There were a few rumblings related to this in the comments on CNET’s coverage of the Vonage Mobile VoIP service back in October. Does anyone notice that this is the same GUI (on the website and for the iPhone app) as Truphone…did they buy the Truphone app and re brand it? And yes…why is this app okay but not Google Voice…come on Apple and AT&T, what gives! Here is a screenshot I took today while trying to sign into the Vonage iPod Touch app with my Vonage Mobile user info. The same credentials I used to create an account via the Vonage Mobile iPhone app. 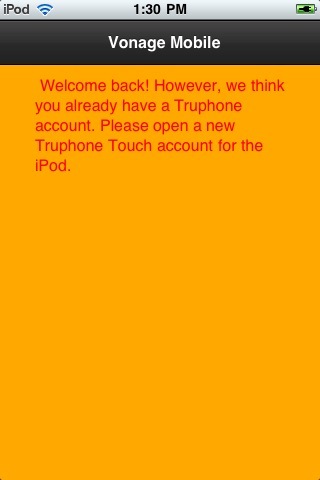 It’s also the same error I get with Truphone iPod app under the same circumstances, no surprise there. I can’t find any details regarding the relationship between Vonage and Truphone. My guess is that Vonage did a private label deal with Truphone and this screen snuck by the QA/Testing group(s).